05-04-2017 Notes from a transoceanic cruise Some things to share from a recently completed Miami to Barcelona cruise on Oceania’s Marina that may be helpful in planning for a transoceanic voyage. 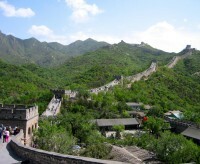 Many know the Great Wall of China is the biggest military construction on earth – and know to dismiss the ‘only man-made structure able to be seen from space’ claim as urban myth. Rippling across huge swathes of the Chinese countryside, around 2000km still exists of its earlier 7300km sections. They were built by independent kingdoms between the 7th and 4th centuries BC.